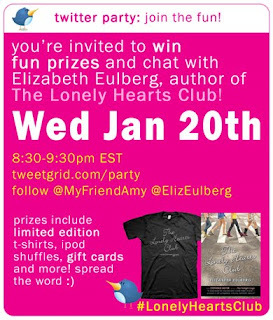 * Be sure to follow Elizabeth @ElizEulberg and Amy @MyFriendAmy before the party! * Join the fun! No one expects you or your tweets to be perfect; we’re just happy you made it to the party! * Anyone who tweets during this hour using #LonelyHeartsClub is entered to win a limited edition Lonely Hearts Club t-shirt! * Watch for questions from @MyFriendAmy and win awesome prizes including an iPod shuffle, $50 iTunes gift card or $25 VISA gift card! * To join the party, you can use our official party tweetgrid or just search #LonelyHeartsClub on Twitter. * Please don’t post any spoilers and don’t forget to pay attention to the time zones, the party starts at 8:30pm EST. I've got this on my calendar - now, I just need to remember to look at my calendar on Wednesday!